Excellent item. Exactly as listed. Very fast turnaround. A+++ HIGHLY RECOMMEND! Gift for a friend who LOVES it. Quiet enough to use in church! The item is awesome! IT ROCKS! Fast ship! Thanks! The safety switch broke just by picking the heater up and moving it. Ran out of this item, refund was given. This Comfort Zone electric heater looks, and performs excellently !! 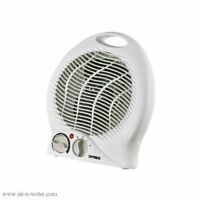 The heater is : 1) very light weight; 2) very quiet; 3) is well designed ( it looks good ); 4) it uses very little electricity compared to other heaters; 5) the tip-over safety feature is very nice ! I expected a stronger velocity of power on the high setting. I have another small heater and the high speed blows out a current twice as strong. It does warm a small room up, say, a bathroom but I've not used it to heat a larger room such as a bedroom. The tip-over safety feature of this model is a plus, although it's probably a standard feature now on most portable space heaters. For the price, it’s ok, especially for what I’m using it for. I would not use this in a quiet office or in a bedroom, it is kinda noisy. I bought it to keep a small work area around 78-80°F in order to provide a good environment for epoxy to set up and cure properly. I was first confused how the settings actually are: the temperature dial allows the unit to turn on and off to keep the space within a certain plus or minus temperature range that you set. The high and low heating function doesn’t change the fan speed, it only changes how hot the coil (I assume it’s a coil) gets. It might make more sense to set it on low when need a closer tolerance of temperature range, since it would be more sensitive to temp changes and run for a longer period of time while it’s on. There is also a fan only setting, which seems pretty hopeless since all the air is directed one way and it’s not a large fan. Overall, I’m content with it. I just hope it lasts a couple years. I was anticipating it being considerably larger than it is, but it’ll work for my application. I really like how this Comfort Zone product is a multi-functional device. It's a heater, and a fan. 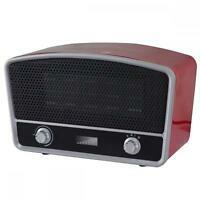 It has a great feature for safety that automatically shuts off the heater if it tilts over. Although this heater/fan is small it'll heat up a whole room. 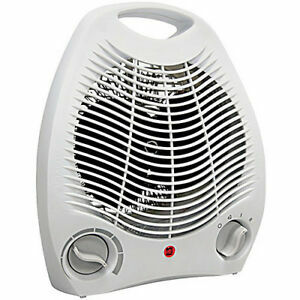 I'd highly recommend this heater for anyone leaving in a dorm, studio apartment, or one bedroom. Heats up the bedroom nicely. I like that it has heat and fan level adjustments! The auto turn off feature is a plus!